August 12, 2013 | Coptalk.Info - What you do not know will shock you! We’ve all been there. You’re cruising down the road, singing along to the radio, when you see flashing blue and red lights in your rearview mirror. You stomp on the brake, wondering what you did wrong. Did you roll through a stop sign? Were you allowed to make that right-hand turn? Is a brake light out? All of the above? Your mind is racing as you slow down and pull over. Palms sweaty, you watch as the officer exits his car and begins the slow walk to your door. Now what? Here are some pointers about what to do when you’re pulled over to make the experience as painless as possible — whether you were in the right or wrong. 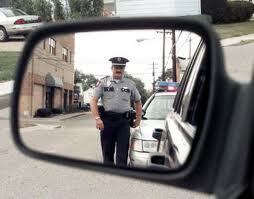 The first item of business is to alert the officer that you intend to pull over. Turn your blinker on and safely get to the side of the road as soon as possible. Outrunning a squad car is for the people on “Cops,” and look what happens to them. Don’t panic; freaking out is only going to worsen the situation. For all you know, the officer pulled you over to alert you to a faulty headlight. When you’re calm you can think coherently and cooperate. Unless the officer signals or tells you to, remain behind the wheel. Getting out of your car may put the officer in a defensive position. You don’t want that. While you will likely be asked for your registration, which is almost always in your glove box, wait for the officer to ask for it. When you reach across the car to retrieve it, the officer may think you’re reaching for a weapon, which may cause him to reach for his. Don’t try to “stick it to the man” even if you feel you’re in the right. They may decide to stick it to you by handing you a hefty fine for being uncooperative or rude. Be polite. Work with the officer. Make your actions and speech clear and easy to understand. If you’re issued a ticket, sign it. You have to. You’re not admitting guilt, you’re just saying, “Hey, I understand I received a ticket.” That’s it. You don’t gain anything by not signing. If you’re having problems with this one, you may want to revisit the previous tip. Signing it doesn’t mean you can’t go to court to refute the fine. That’s the gist of it. Remember, always drive in a safe manner to avoid being pulled over altogether. That’s the best way to avoid difficult situations.